The scholarships are offered for 4 study programs: Information Technology, Accounting, Pharmaceutical Engineering and Biomedical Engineering. Send scholarship proposal via email to marketing@sgu.ac.id or to SGU Campus at the latest of 15 May 2011. Fulfillment of all registration requirements. Must obtain TOEFL/IELTS minimum 500/5.5. Result of the high school report of class 10 and 11 should be above high school average. Pass the SGU Assesment Interview. 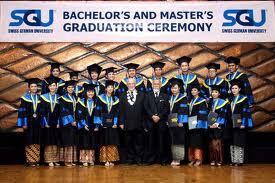 For following semesters, the scholarship will be based upon the academic achievement (min. GPA 3,5) and active participation in student organizations. Certified photocopy of High School official certificate (IJAZAH SMA/SMK/MA), legalized by the Principal (once it is published). Certified photocopy of High School official transcript (SKHUN of SMA/SMK/MA), legalized by the Principal (once it is published). Poverty statement from Local Authority/Kelurahan must be submitted (Foundation Scholarships). Valid only for Indonesian nationals (Foundation Scholarships). Scholarships based on the best academic semester result are offered in semester 2, 4, 5, 7 and 8 for students for each class. The selection of scholarship holders will be made by the Examination Steering Committee by considering academic achievement and active participation in student organization. Visit Official Website. Demikianlah informasi Undergraduate Scholarships, Swiss German University, Indonesia kami sampaikan, semoga bermanfaat.